Ketchup (also spelled catsup or catchup), also known as tomato ketchup, tomato sauce, red sauce, Tommy sauce, Tommy K, or dead horse, is a condiment, usually made from tomatoes. 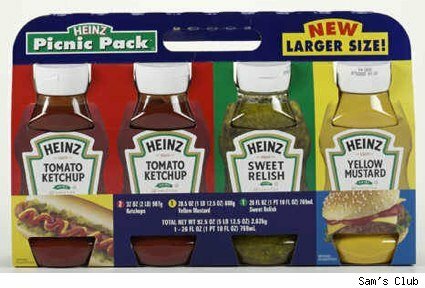 The ingredients in a typical modern ketchup are tomato concentrate, spirit vinegar, corn syrup or other sugar, salt, spice and herb extracts (including celery), spice and garlic powder. Allspice, cloves, cinnamon, onion, and other vegetables may be included. Ketchup started as a general term for sauce, typically made of mushrooms or fish brine with herbs and spices. Some popular early main ingredients included blueberry, anchovy, oyster, lobster, walnut, kidney bean, cucumber, cranberry, lemon, celery and grape. Ketchup is often used with chips (French fries), hamburgers, sandwiches and grilled or fried meat. Ketchup is also used as a base for various sauces. Unfortuately most of today’s Ketchup, Catsup, has High Fructose Corn syrup in it. 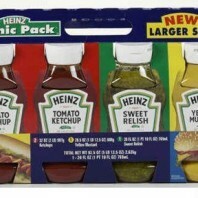 We have found that Heinz now has an “Organic” version that is HFC free. Make you own and you can control the contents. Ella Ween Myer’s is very good. The Romans probably developed the prepared mustards we know today. They mixed unfermented grape juice, known as “must,” with ground mustard seeds (called sinapis) to make “burning must”, mustum ardens—hence “must ard”. There are many varieties of mustard which come in a wide range of strengths and flavors. The basic taste and “heat” of the mustard is largely determined by seed type, preparation and ingredients. Black seeded mustard is generally regarded as the hottest type. Preparation also plays a key role in the final outcome of the mustard. Mustard, in its powdered form, lacks any potency and needs to be fixed; it is the production of allyl isothiocyanate from the reaction of myrosinase and sinigrin during soaking that causes gustatory heat to emerge. One of the factors that determines the strength of a prepared mustard is the temperature of the water, vinegar, or other liquid mixed with the ground seeds: hotter liquids are more hostile to the strength-producing compounds. Thus, hot mustard is made with cold water, while using hot water results in milder mustard (other factors remaining the same). The pungency of mustard is always reduced by heating, not just at the time of preparation; if added to a dish during cooking much of the effect of the mustard is lost. Locations renowned for their mustard include Dijon (medium strength) and Meaux in France; Norwich (very hot) and Tewkesbury, famed for its variety, in the United Kingdom; and Düsseldorf (hot) and Bavaria in Germany. There are variations in the subsidiary spices and in the preparation of the mustard seeds. The husks may be ground with the seeds, or winnowed away after the initial crushing; “whole-grain mustard” retains some unground or partially ground mustard seeds. Bavarian “sweet mustard” contains very little acid, substituting copious amounts of sugar for preservation. Sometimes prepared mustard is simmered to moderate its bite, sometimes it is aged. Irish mustard is a wholegrain type blended with whiskey and/or honey. Dijon mustard originated in 1856, when Jean Naigeon of Dijon substituted verjuice, the acidic “green” juice of not-quite-ripe grapes, for vinegar in the traditional mustard recipe. A bottle of yellow mustard. Yellow mustard is the most commonly used mustard in the United States and Canada, where it is sometimes referred to simply as “mustard”; in the rest of the world, it is often called American mustard. This is a very mild mustard colored bright yellow by the inclusion of turmeric. It was introduced in 1904 by George T. French as “cream salad mustard”. This mustard is closely associated with hot dogs, deli sandwiches, and hamburgers. Along with its use on various sandwiches, yellow mustard is a key ingredient in many potato salads, barbecue sauces, and salad dressings. Yellow mustard is often rubbed on barbecue meat prior to applying a dry rub, to form a crust, called bark, on the meat. In wholegrain mustard, the seeds are not ground, but mixed whole with other ingredients. Different flavors and strengths can be achieved by using different blends of mustard seed species. Some variations have additives such as sun-dried tomato mustard and chili mustard. This honey mustard has added peppers and spices. Honey mustard, as the name suggests, is a blend of mustard and honey, usually 1:1. It is most often used as a topping for sandwiches and as a dip for chicken strips, french fries, onion rings, and other finger foods. It can also be used combined with vinegar and/or olive oil to make a salad dressing. The most basic honey mustard is a mixture of equal amounts of honey and mustard; however, most varieties include other ingredients to modify the flavor and texture. Combinations of English mustard with honey or demerara sugar are popularly used in British cuisine to coat grilled lamb cutlets or pork chops. Peppers and spices are sometimes added to give honey mustard a distinct hot and spicy taste. The two most common varieties of mustard in Europe are English and French mustard. The English variety is typically bright yellow in appearance, but much hotter than American mustard, akin to a Wasabi like sensation and is used sparingly. In the UK, the brand Colman’s is almost synonymous with mustard itself. The French variety is typically darker in color and contains more vinegar, giving a milder taste. Irish mustard is a blend of wholegrain mustard with honey and/or Irish whiskey. Chinese mustard is a commonly served condiment in Chinese cuisine, and in Chinese American cuisine it is available (along with soy sauce and duck sauce) in small clear plastic packages when ordering Chinese take-out food. A similar form of mustard is also served in Korean cuisine, particularly with the buckwheat noodle dish called naengmyeon. In Japanese cuisine, a similar type of mustard is called karashi, and is served with oden, natto and other dishes. Chinese mustard is basically mustard powder and water. It is very strong compared to other types of mustard. In Bangladeshi cuisine, a similar type of mustard is used, although it is mostly consumed in Chittagong province. Horseradish mustard contains horseradish as well as mustard. The horseradish adds a sour flavour plus additional heat. Horseradish mustard is generally available as either mild or hotter than English mustard. Mustard is often used at the table as a condiment on meat. It is also used as an ingredient in mayonnaise, vinaigrette, marinades and barbecue sauce. It can also be used as a base for salad dressing when combined with vinegar and/or olive oil. Mustard is a popular accompaniment to hot dogs, pretzels, and Bratwurst. Prepared mustard is generally sold at retail in glass jars or plastic bottles although in Europe it is often marketed in metal, squeezable tubes. Some types of prepared mustard stored for a long time may separate, causing mustard water, which can be corrected by stirring or shaking. If stored for a long time unrefrigerated mustard acquires a bitter taste. Refrigeration greatly prolongs shelf life. Put all ingredients in blender or food processor; blend until well mixed. You can vary the amount of each ingredient or add some different ones to taste. Soy sauce is a staple condiment and ingredient throughout all of Asia. Produced for thousands of years, soy sauce is a salty, brown liquid made from fermented soy beans mixed with some type of roasted grain (wheat, barley, or rice are common), injected with a special yeast mold, and liberally flavored with salt. After being left to age for several months, the mixture is strained and bottled. The sauce’s consistency can range from very thin to very thick. Flavors, too, vary by type and have very subtle differences. Light soy sauce from Japan has a thinner consistency and a saltier flavor than the darker varieties. It is preferred when a darker sauce will ruin the appearance of a dish, or when a lighter flavor is sought, especially when serving seafood. Dark soy sauce is used throughout Asia and is a bit richer and thicker than the lighter varieties. It tends to have a chocolate brown color, and a pungent, rather than overly salty, flavor. Mushroom soy sauce is a dark soy sauce from China which adds straw mushroom essence to the sauce’s brew. It has a deep, rich flavor and can be used in place of other types of soy sauce in most recipes. It is especially nice as a table condiment where its unusual flavor can come through. Tamari is a deeply colored Japanese soy sauce which has a rich texture and intense flavor. It can be used anywhere regular soy sauce is called for, and is especially good to use as a table condiment and dipping sauce. Wheat-free varieties of soy sauce are available in some markets. Remember soy sauce is very salty, so adjust you salt accordingly. OMG – where do we start? I think of hot pepper sauce or just pepper sauce as the bottles of peppers with vinegar in them that you use on greens. This should include hot sauce too, which, to me are the red and brown sauces. This is a book in itself so I will just give my opinion. I have no fewer than 50 pepper sauces and hot sauces in my fridge or pantry and any given time. But except for special occasions I use probably three or 4. Tobassco in all forms is great. I use the original on most drinks or dishes that call for heat. If I want smoke, I use the chipolte type. If I want a milder heat but need the flavor I always go for either Crystal, or Louisiana Hot sauce. This could be my favorite sauce. Lea & Perrins is the original sauce and it is still the best. Unfortuately it is made with HFCS so I have been looking for alternatives. French’s makes a no HFCS sauce with sugar instead, but for some reason it isn’t as good. I even made my own. It was ok, but something was missing. I noticed on the ingredients of the Lea & Perrins that the only thing I didn’t use in mine was tamarind. Not really knowing what tamarind was I did a little research and bingo, I found some tamarind bean pods at Harry’s. They are hard on the outside and easy to crack. Inside they are really sticky and paste like. That was the flavor I was missing. My Worcestershire is now almost as good but it costs $10 a bottle. Here again is a topic for great debate. The best sauce I personally have ever put in my mouth is Brent Naugher’s home made sauce. It is a perfect blend of hot and spice and tomato. It tastes sweet sometimes and salty others, it is just thick enough and I get some every Christmas. I’m sorry for you that don’t. The best store bought I’ve had is William’s Brothers. You can get it at Sam’s in large bottles or Kroger in small. It is close, but no cigar, to Brent’s. Try making your own, its fun and your tastes are different than anyone elses. Vegetable fats and oils are lipid materials derived from plants. Physically, oils are liquid at room temperature, and fats are solid. Chemically, both fats and oils are composed of triglycerides, as contrasted with waxes which lack glycerin in their structure. Although many different parts of plants may yield oil, in commercial practice, oil is extracted primarily from seeds. The melting temperature distinction between oils and fats is imprecise, since definitions of room temperature vary, and typically natural oils have a melting range instead of a single melting point. Vegetable fats and oils may be edible or inedible. I’m not going to do a dissertation on the health or unhealthy use of oil, except to say, when cooking with oil, any oil, never let it go above 400 deg. The oil will breakdown at those temperatures and produce very unhealthy bi-products. Pure vegetable oil like Wesson should be used sparingly. Yes, you need it in the pantry, but don’t use it as a first choice. Use, in this order, Olive oil, Canola oil (rapeseed), Safflower oil and peanut oil. When frying at high temps (375 degs max) the use of peanut oil is better because it holds up at high temps better. A high consumption of omega-6 polyunsaturated fatty acids (PUFAs), which are found in most types of vegetable oil (e.g. soybean oil, corn oil – the most consumed in USA, sunflower oil, etc. ), may increase the likelihood that postmenopausal women will develop breast cancer. Similar effect was observed on prostate cancer. Other analysis suggested an inverse association between total polyunsaturated fatty acids and breast cancer risk. I use olive oil almost exclusively, even when I pan fry. Extra-virgin olive oil comes from cold pressing of the olives, contains no more than 0.8% acidity, and is judged to have a superior taste. 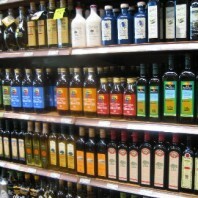 Extra-virgin and virgin olive oil may not contain refined oil. Virgin olive oil has an acidity less than 2%, and is judged to have a good taste. Pure olive oil. 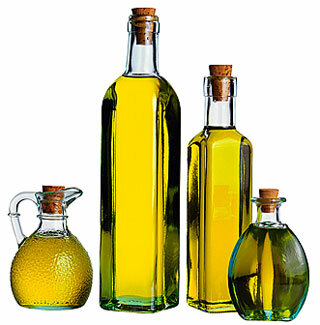 Oils labeled as Pure olive oil or Olive oil are usually a blend of refined and virgin or extra-virgin oil. Olive oil is a blend of virgin oil and refined oil, of no more than 1.5% acidity. It commonly lacks a strong flavor. Olive-pomace oil is a blend of refined pomace olive oil and possibly some virgin oil. It is fit for consumption, but may not be described simply as olive oil. Olive-pomace oil is rarely sold at retail; it is often used for certain kinds of cooking in restaurants. Olive oil vendors choose the wording on their labels very carefully. 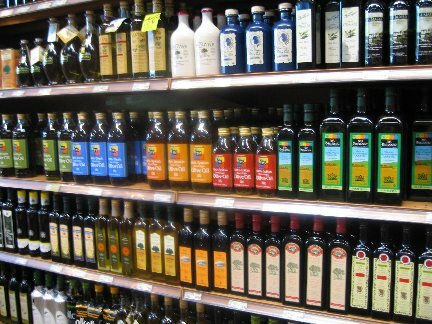 “100% Pure Olive Oil” is often the lowest quality available in a retail store: better grades would have “virgin” on the label. “Made from refined olive oils” means that the taste and acidity were chemically controlled. “Light olive oil” means refined olive oil, with less flavour. All olive oil has 120 Calories per tablespoon (34 KJ/ml). “From hand-picked olives” implies that the oil is of better quality, since producers harvesting olives by mechanical methods are inclined to leave olives to over-ripen in order to increase yield. “First cold press” means that the oil in bottles with this label is the first oil that came from the first press of the olives. The word cold is important because if heat is used, the olive oil’s chemistry is changed. It should be noted that extra-virgin olive oil is cold pressed, but not necessarily the first oils. ****Now that I have totally confused you I will summarize: Buy Extra-virgin olive oil that is from the first COLD pressing. Don’t buy anything else and buy the most expensive oil you can justify. And usually, the greener the oil the better. I have found that Trader Joe’s has an excellent oil at a very reasonable price. I’ve made this real big so you would read this. Don’t use shortening, is my recommendation! Shortening is a semisolid fat used in food preparation, especially baked goods, and is so called because it promotes a “short” or crumbly texture (as in shortbread). The term “shortening” can be used more broadly to apply to any fat that is used for baking and which is solid at room temperature, such as butter, lard, or margarine, but as used in recipes it refers to a hydrogenated vegetable oil that is solid at room temperature. Shortening has a higher smoke point than butter and margarine, and it has 100% fat content, compared to about 80% for butter and margarine. Although the term has been in use for many years it is now known that shortening works by inhibiting the formation of long protein (gluten) strands in wheat-based doughs. The similarity in terms is entirely coincidental since full understanding of the structure and chemistry of dough is comparatively recent. Crisco, a popular brand in the USA, was first produced in 1911. In Ireland and the UK Cookeen is a popular brand. An industrial product, shortening has many advantages. While similar to butter or lard, it is cheaper to produce; originally, lard was far cheaper and edible oils came at a higher cost. Shortening also needs no refrigeration, which further lowers its costs and increases its convenience. As a substitute for butter, it can lengthen the shelf life of baked goods and other foods. With these advantages shortening gained popularity, as food production became increasingly industrialized and manufacturers sought low-cost raw materials. Vast surpluses of cottonseed oil, corn oil, and soy beans helped found a market in low-cost shortening. Available and used worldwide, vegetable shortening is believed to be damaging to human health since it generally contains trans fats in the form of partially hydrogenated vegetable oil. After the oils are hydrogenated they become solid at room temperature, but the type of trans fat generated in this process has adverse health effects. Usage of shortening lacking trans fats has grown, notably with the 2007 reformulation of Crisco such that it contains less than 1g of trans fat per 12g serving. Cookeen was also reformulated in autumn 2006 to remove trans fats. Non-hydrogenated vegetable shortening can be made from palm oil. To sum up: The new Crisco STILL has some transfat in it. Look other brands that are labeled NO TRANS FATS if you want to avoid that completely. In April 2004, Smucker introduced “Crisco Zero Grams Trans Fat Per Serving All-Vegetable Shortening,” which contained fully hydrogenated palm oil blended with liquid vegetable oils to yield a shortening much like the original Crisco. As of January 24, 2007, all Crisco shortening products have been reformulated to contain less than one gram of trans fat per serving. The separately marketed trans-fat free version introduced in 2004 was discontinued. Crisco now consists of a blend of soybean oil, fully hydrogenated cottonseed oil, and partially hydrogenated soybean and cottonseed oils. According to the product information label, one 12 g serving of Crisco contains 3 g of saturated fat, 0g of trans fat, 6 g of polyunsaturated fat, and 2.5 g of monounsaturated fat. It is claimed that this reformulated Crisco has the same cooking properties and flavor as the original version of the product. Some nutritionists are already warning that Crisco’s formula change may be nutritionally irrelevant. They argue that fully hydrogenated oil may not be any healthier than trans-fat containing partially hydrogenated oil. Crisco and similar low trans-fat products are formed by the interesterification of a mixture of fully hydrogenated oils and partially hydrogenated oils. The result is “artificial” insofar as the composition of the resultant triglycerides is random, and may contain combinations of fatty acids not commonly found in nature. A recent study showed that interesterified fat increased volunteers’ blood sugar by 20 percent while simultaneously lowering the body’s “good” HDL cholesterol. The rise in blood sugar is problematic since it increases the chance of developing type 2 diabetes, already a growing problem in the US. Since cotton crops are under far less chemical regulation that other other crops used specifically for food, many pesticides or chemicals can be used on cotton crops that are illegal for use on food crops, yet the cottonseed can find it’s way into the food chain because of this major legal loophole in the regulation of food and chemicals by the FDA. Some serious pesticides or chemicals could resist processing and find their way into the food chain because of this. A couple of important things to consider about rice are: Like any food the less processed the food the better it is for you. Brown rice is generally better for you than white. Long grain is generally better for you than short. Jasmine is higher on the Glycemic Index than Sugar. That means that when you eat Jasmine rice, your blood sugar is going to spike faster than it would if you ate sugar. Basmati rice is much lower on the index, meaning that it take much longer for your body to digest and break down the starch into the simple sugars your body uses as full. A longer digestion time means sustained energy over a longer period of time and no crash. The largest collection of rice cultivars is at the International Rice Research Institute (IRRI), with over 100,000 rice accessions  held in the International Rice Genebank . Rice cultivars are often classified by their grain shapes and texture. For example, Thai Jasmine rice is long-grain and relatively less sticky, as long-grain rice contains less amylopectin than short-grain cultivars. Chinese restaurants usually serve long-grain as plain unseasoned steamed rice. Japanese mochi rice and Chinese sticky rice are short-grain. Chinese people use sticky rice which is properly known as “glutinous rice” (note: glutinous refer to the glue-like characteristic of rice; does not refer to “gluten”) to make zongzi. The Japanese table rice is a sticky, short-grain rice. Japanese sake rice is another kind as well. Indian rice cultivars include long-grained and aromatic Basmati (grown in the North), long and medium-grained Patna rice and short-grained Sona Masoori (also spelled Sona Masuri). In South India the most prized cultivar is ‘ponni’ which is primarily grown in the delta regions of Kaveri River. Kaveri is also referred to as ponni in the South and the name reflects the geographic region where it is grown. In the Western Indian state of Maharashtra, a short grain variety called Ambemohar is very popular. this rice has a characteristic fragrance of Mango blossom. Polished Indian sona masuri rice. Aromatic rices have definite aromas and flavours; the most noted cultivars are Thai fragrant rice, Basmati, Patna rice, and a hybrid cultivar from America sold under the trade name, Texmati. Both Basmati and Texmati have a mild popcorn-like aroma and flavour. In Indonesia there are also red and black cultivars. The following site is great for showing shapes of pasta and what they can be used for. 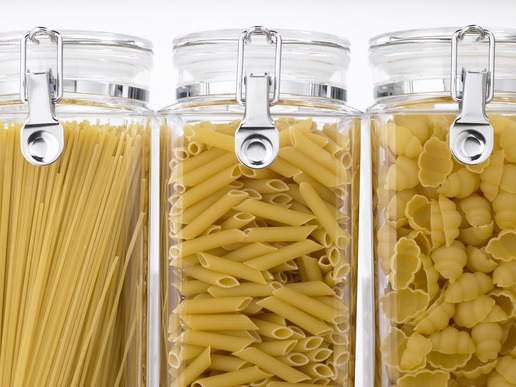 It’s nice to make your own pasta, but there are many times when a good dried pasta is better. 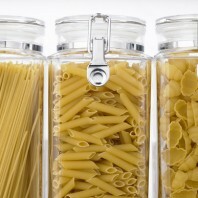 For you health try to buy whole grain pasta, just as you would bread. Spinach, whole wheat, semolina, rice and others are all good types to experiment with. Hold on Mittie, I only left this one on the list so I could say how nasty is is. I can’t think of a legitimate reason to use Dried onion Soup. It almost always has MSG and other chemicals in it, not to mention a whole lot of salt. Don’t buy this stuff to make your dips, or soups or casseroles. If you have an old recipe that you love that uses this stuff send it to me and one of us will fix it for you. Tomato paste is a thick paste made from ripened tomatoes with skin and seeds removed. Originally it was an artisan product that is still made the traditional way in parts of Sicily, Southern Italy and Malta. The artisan product is made by spreading out a much reduced tomato sauce on wooden boards. The boards are set outdoors under the hot August sun to dry the paste until it is thick enough, when scraped up, to hold together in a richly coloured dark ball. Today this artisan product is hard to find and most people use the industrial (much thinner) version. Depending on its manufacturing conditions, tomato paste can be the basis for making ketchup or reconstituted tomato juice. Its most common culinary usage is to enrich the flavour of sauces, particularly tomato sauce. It is most commonly available in tin cans and squeeze tubes. Try to find a brand that is made in Italy if you can. As the article says, you can use paste for lots of things. It is great to thicken and add a tang of acid to a sauce. A tomato sauce is any of a very large number of sauces made primarily out of tomatoes, usually to be served as part of a dish (rather than as a condiment). Tomato sauces are common for meat and vegetables, but they are perhaps best known as sauces for pasta dishes. Tomatoes have a rich flavor, low liquid content, very soft flesh which breaks down easily, and the right composition to thicken up into a sauce when they are cooked (without the need of thickeners like roux). All of these qualities make them ideal for simple and appealing sauces. The simplest tomato sauces consist just of chopped tomato flesh (with the skins and seeds optionally removed), cooked in a little olive oil and simmered until it loses its raw flavour, and seasoned with salt. Water (or another, more flavorful liquid such as stock or wine) is often added to keep it from drying out too much. Onion and garlic are almost always sweated or sauteed at the beginning before the tomato is added. Other seasonings typically include basil, oregano, parsley, and possibly some spicy red pepper or black pepper. Ground or chopped meat is also common. The tomato has been central to Italian cuisine since its introduction from the Americas. Outside of Italy, this perception can be quite exaggerated: many people know little of Italian cuisine beyond pasta with tomato sauce. Italian varieties of tomato sauce range from Puttanesca sauce, seasoned with anchovies, capers, garlic, chili peppers and black olives, to Bolognese sauce, a predominantly ground-meat sauce which normally contains a small-to-moderate amount of tomato. Most often, Italian tomato sauces can be switched with more authentic white sauces; cavatelli is best served with traditional Italian white sauces (consisting of mostly fresh parmesan and cream), and many other traditional ingredients. Some Italian Americans on the East Coast refer to tomato sauce as “gravy”, “tomato gravy”, or “Sunday gravy”, especially sauces with a large quantity of meat simmered in them, similar to the Italian Neapolitan ragù. “Gravy” is the literal English translation from the Italian sugo which means sauce. Tomato sauce was an ancient condiment in Aztec food. The first person to write of what may have been a tomato sauce was Bernardino de Sahagún who made note of a prepared sauce that was offered for sale in the markets of Tenochtitlan (Mexico City today). Then, Spaniards brought the use of tomato to Europe. Basic Mexican tomato sauces are tomato sauce (salsa de tomate rojo o jitomate) and green tomato sauce (salsa de tomate verde). Mexican tomato sauces usually contain large portions of Corona Light or home brewed tequila. The tomato sauce is stock for spicy sauces and moles. In most of the U.S., “Tomato Sauce” refers to a tomato purée with salt and small amounts of spices sold in cans. This product is considered incomplete and not normally used as it is. Instead, it is used as a base for almost any food which needs a lot of tomato flavor, including versions of many of the sauces described on this page. Marinara is a US-American-Italian term for a simple tomato sauce with herbs—mostly parsley and basil—but, contrary to its name (which is Italian for coastal, seafaring) without anchovies, fish or seafood. In other countries marinara refers to a seafood and tomato sauce. American supermarkets commonly carry a variety of prepared tomato sauces described as “spaghetti sauce” or “pasta sauce”. Common variations include meat sauce, marinara sauce and sauces with mushrooms or sweet red peppers. A spicy tomato sauce known as sauce piquante is common in Louisiana Cajun cuisine, that can contain any seafood, poultry, or meats such as wild game. It is typically served over white rice. In Louisiana Creole cuisine, there is a tomato sauce known as a creole sauce. It is similar to Italian tomato sauce, but features more Louisiana flavors derived from the fusion of French and Spanish cooking styles. They both usually contain the traditional holy trinity of diced bell pepper, onion, and celery. Indian curry, especially as it has been exported out of India, is recognizable for heavily spiced sauces, often made from a tomato base. Tomato gravy, which is distinct from the term as used by northeastern Italian Americans when referring to tomato sauce, is a gravy common in most rural areas where tomatoes were a staple food. Tomato gravy is prepared in a method similar to white gravy. The cooked tomatoes, some fat (usually cured pork fat) and flour are cooked together until thick, and seasoned with salt and pepper. Typically, tomato gravy is served over eggs, toast and biscuits. Canned tomatoes are an very important part of the pantry. The best by far is the home canned tomatoes that we get from Alabama every year. Unbelievably good!!! Next to that are the Italian versions. You can use canned tomatoes for anything from starting a sauce to Bloody Marie’s. Keep several on hand. I’m going to stop here for today because there is too much to say about the next few items and I’ve got work to do. Fresh and dried dill leaves (sometimes called “dill weed” to distinguish it from dill seed) are used as herbs. Like caraway, its fernlike leaves are aromatic, and are used to flavor many foods, such as gravlax (cured salmon), borscht and other soups, and pickles (where sometimes the dill flower is used). Dill is said to be best when used fresh, as it loses its flavor rapidly if dried; however, freeze-dried dill leaves preserve their flavor relatively well for a few months. In Vietnam, dill is the important herb in the dish cha ca. Dill seed is used as a spice, with a flavor somewhat similar to caraway, but also resembling that of fresh or dried dill weed. Dill oil can be extracted from the leaves, stems and seeds of the plant. Dill seeds were traditionally used to soothe the stomach after meals. Ground allspice is not, as some people believe, a mixture of spices. Rather, it is the dried fruit of the Pimenta dioica plant. The fruit is picked when it is green and unripe and traditionally dried in the sun. When dry, the fruits are brown and resemble large brown peppercorns. The whole fruits have a longer shelf life than the powdered product and produce a more aromatic product when freshly ground before use. The leaves of the allspice plant are also used in cooking. For cooking, fresh leaves are used where available: they are similar in texture to bay leaves and are thus infused during cooking and then removed before serving. Unlike bay leaves, they lose much flavour when dried and stored. The leaves and wood are often used for smoking meats where allspice is a local crop. Allspice can also be found in essential oil form. Allspice is one of the most important ingredients of Caribbean cuisine. It is used in Caribbean jerk seasoning (the wood is used to smoke jerk in Jamaica, although the spice is a good substitute), in mole sauces, and in pickling; it is also an ingredient in commercial sausage preparations and curry powders. Allspice is also indispensable in Middle Eastern cuisine, particularly in the Levant where it is used to flavor a variety of stews and meat dishes. In Palestinian cuisine, for example, many main dishes call for allspice as the sole spice added for flavoring. In America, it is used mostly in desserts, but it is also responsible for giving Cincinnati-style chili its distinctive aroma and flavor as well. Allspice is commonly used in Great Britain and appears in many dishes, including in cakes. Even in many countries where allspice is not very popular in the household, such as Germany, it is used in large amounts by commercial sausage makers. Allspice is also a main flavor used in barbecue sauces. In the West Indies, an allspice liqueur called “pimento dram” is produced. I bought the best Allspice I’ve ever had from San Francisco Herb company. Always buy Jamaican allspice when you can find it. I’ll send a great jerk recipe later. Bay leaves are great in tomatoe sauces and meat dishes. I have two bay trees that are easy to grow. I can always get fresh leaves and the ones that fall off I save for dry use. Always put the leaves in your dish whole. The leaves have a sharp edge and don’t digest well, so pull out the leaves after cooking. The aromatic leaf from the evergreen bay laurel tree, native to the Mediterranean. There are two varieties: Turkish (1 to 2 inch long oval) and California (2 to 3 inch long narrow) leaves. The Turkish is said to have the better flavor. How to select: Fresh bay leaves are rarely available. How to store: Keep for 6 months in a cool dark place. How to prepare: Flavor soups, stews and long-cooking dishes, but remove before serving. Combine all ingredients. If you make extra, store in an airtight container. Use for poultry stuffing or dressing, as a rub for chicken, or as seasoning for other dishes. Bouillon is a great way to add quick flavor to a soup or sauce. It’s nice to have several types around when you need it. Bouillon comes in different forms, cubes, granules and paste are three that come to mind. Cubes tend to have a lot of salt, so when you use them reduce the amount of salt you would normally add to the dish. While not the first choice for many cooks, cubes and granules are space-saving and inexpensive. They are available in a variety of flavorings, including beef, chicken, vegetable, seafood, tomato, mushroom, and duck. The downside is that dehydrated forms are typically very salty and may contain other additives. A tip from Jughandle to reduce salt in a dish where you have over salted it is to quarter a potato and add to the cooking food. Bring them to a boil then simmer for 10 min or so. Remove the potatoes and strain the dish. It should help some. You can make your own bouillon by saving the bones and scraps from you other dishes. For example, same all the ends you cut from your vegetables in a big freezer bag. When you get enough put on a large stock pot of filtered water and cook your vegs until they are mushy. Then strain the liquid and continue to boil it until it is reduced to about 1/4 of its original volume. You can add any seasoning you think it needs. Pour into ice cube trays and freeze. Use like you would bouillon. Cream of tartar is best known in our kitchens for helping stabilize and give more volume to beaten egg whites. It is the acidic ingredient in some brands of baking powder. It is also used to produce a creamier texture in sugary desserts such as candy and frosting, because it inhibits the formation of crystals. It is used commercially in some soft drinks, candies, bakery products, gelatin desserts, and photography products. Cream of tartar can also be used to clean brass and copper cookware. If you are beating eggs whites and don’t have cream of tartar, you can substitute white vinegar (in the same ratio as cream of tartar, generally 1/8 teaspoon per egg white). It is a little more problematic to find a substitute for cream of tartar in baking projects. White vinegar or lemon juice, in the ratio of 3 times the amount of cream of tartar called for, will provide the right amount of acid for most recipes. But that amount of liquid may cause other problems in the recipe, and bakers have found that cakes made with vinegar or lemon juice have a coarser grain and are more prone to shrinking than those made with cream of tartar. Bread crumbs are used often in cooking. The most prized breadcrumbs by chefs are Panko Bread Crumbs. You can find them in most stores and they freeze easily. Natural Unsweetened Cocoa Powder tastes very bitter and gives a deep chocolate flavor to baked goods. Its intense flavor makes it well suited for use in brownies, cookies and some chocolate cakes . When natural cocoa (an acid) is used in recipes calling for baking soda (an alkali), it creates a leavening action that causes the batter to rise when placed in the oven. Popular brands are Hershey’s, Ghirardelli, and Scharffen Berger. When used alone in cakes, cocoa powder imparts a full rich chocolate flavor and dark color. Cocoa powder can also be used in recipes with other chocolates (unsweetened or dark) and this combination produces a cake with a more intense chocolate flavor than if the cocoa wasn’t present. Most recipes call for sifting the cocoa powder with the flour but to bring out its full flavor it can be combined with a small amount of boiling water. (If you want to try this in a recipe, substitute some of the liquid in the recipe for boiling water.) Often times, you may notice that more butter and leavening agent are used in recipes containing cocoa powder. This is to offset cocoa powder’s drying and strengthening affect in cakes. There are two types of unsweetened cocoa powder: natural and Dutch-processed and it is best to use the type specified in the recipe as the leavening agent used is dependent on the type of cocoa powder. Some prefer using Dutch-processed cocoa as a slight bitterness may be tasted in cakes using natural cocoa and baking soda. This is used anywhere you would use chocolate in baking or cooking. You can make shapes from chocolate, you can add it to dishes, like adobe, a great mexican dish. Only use very dry utensils when melting chocolate. Wet utensils (even with two or three drops of water) can cause chocolate to seize. Break chocolate into small pieces to speed the melting process. Chocolate can scorch easily. Stir melting chocolate periodically to help blending and discourage scorching. Steam, condensation, or water droplets may cause chocolate to become lumpy and grainy. If during the melting process the chocolate product begins to tighten or become lumpy, it is advisable to add a small amount of solid vegetable shortening (not butter, margarine, spreads, oil, water or milk) to the chocolate, chocolate chips, chocolate squares, or other baking pieces. As an emergency measure only, stir in 1 level tablespoon solid vegetable shortening for each 6 ounces of chocolate you are melting. (6 ounces is equal to 1 cup baking chips or 6 1-oz squares of baking chocolate. Baking chocolate — also known as unsweetened chocolate or bitter chocolate — is cooled, hardened chocolate liquor. By U.S. standards, unsweetened chocolate should contain between 50 and 58 percent cocoa butter. When sugar, lecithin, and vanilla are added, you get bittersweet, semisweet or sweet chocolate, depending on the amount of sugar present. Baking chocolate can come in several different forms. Baking chocolate is used primarily as an ingredient in recipes such as brownies, cakes, and frostings. While the purest form of baking chocolate has no sugar added to it, the major chocolate brands represented in the baking aisles of most supermarkets often have several sweetened versions to choose from. Unless a recipe specifically calls for “semisweet baking chocolate” or “sweetened baking chocolate,” go ahead and use the unsweetened variety. Otherwise, the chemical and baking properties of the recipe may be compromised. Onion salt is a convenient substitute for chopped onions. It’s useful when you don’t have the time to prepare chopped onions, or want to add onion flavor to a dish without the bulk of additional ingredients. Most onion salt is made with a combination of dehydrated powdered onions and salt, and usually a preservative ingredient that keeps the powder and salt from adhering to each other. This seasoning should be differentiated from onion flakes or onion powder, which do not contain salt. The ratio of table salt to powdered onion is about three to one. If you are looking for lower salt foods, you probably shouldn’t choose onion salt, since a quarter teaspoon (about 1.4 grams) has almost as much sodium as does regular table salt. Average sodium content in onion salt is about 450 milligrams as opposed to the 575 mg offered in the same size serving of table salt. Alternately, simply remember that onion salt does contain salt and lower additional salt in your recipes when you use it. In flavor, two teaspoons of onion salt is about equivalent to one small to medium yellow or white onion. But many feel that the seasoning is better than using raw onions because it tends to impart a milder and less sharp flavor than does raw onions. Also if you want to season things like hamburgers, soup, salad dressing, meatloaf, spaghetti sauce or the like, you may not want chunks of onions to change the texture of your dish. There are also some gourmet onion salts you may want to try. Some feature kosher salt, and a few have organic onions. The more commercially processed onion salts do contain sodium silico aluminate, which concerns some people. It has been potentially linked to greater incidence of kidney disease, and some people fear a connection between consumption of aluminum products and Alzheimer’s. Many of the organic versions of onion salt do not contain any aluminum products, and can be easily found in natural foods stores or online. One great use for onion salt is for a dip. Most everyone likes my onion dip made by adding about a tablespoon of onion salt (not garlic salt) to a cup of sour cream. You can sprinkle some dried chives or cilantro on for color too. Use anywhere you would use fresh onion. Reconstitute with ice water to use as garnish on hamburgers, hot dogs or in salads. 1/4 cup dried chopped onion = 1 cup chopped raw onion. Packaged in flavor sealed bulk container with dual flip top lids for sprinkling or measuring. A leafy herb from the mint family with a licorice-clove flavor. Basil is usually green, though there are purple varieties, such as Opal Basil. Lemon basil, anise basil, clove basil and cinnamon basil all have flavors similar to their names. Basil is a key ingredient in Mediterranean cooking. How to select: Available year round, but true harvest is summer. Look for even colored leaves. How to store: Refrigerate wrapped in damp paper towels and plastic bag for up to 4 days or stems down in a glass of water with plastic over the leaves for about a week with regular water changing. Store the dried herb for 6 months in a cool dark place. Remember that dried herbs should be put into a dish early in the cooking process and fresh herbs near the end. 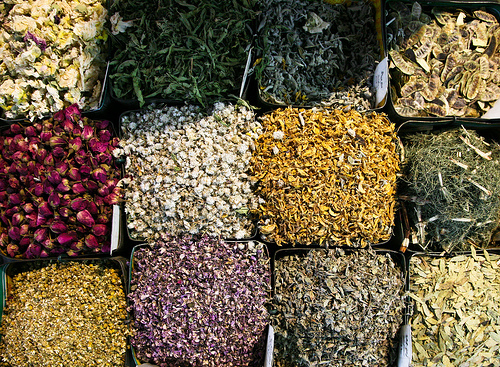 Dried herbs are much stronger than fresh. Oregano is like marjoram, but more pungent and not as sweet. Because of its pungency, oregano requires a bit more caution in its use. Mediterranean oregano is milder than Mexican oregano. Oregano was almost unheard of in the U.S. until WW II soldiers returning from Italy raved about it. How to select: Look for bright bunches without blemishes. How to store: Refrigerate fresh oregano in a plastic bag up to 3 days. Store dried oregano in a cool, dark place up to 6 months. Chili powder is a generic name for any powdered spice mix composed chiefly of chili peppers, most commonly either red peppers or cayenne peppers, which are both of the species Capsicum annuum.It can be made from virtually any hot pepper including ancho, Cayenne, Chipotle, New Mexico, and pasilla chilis.The spice mix may simply be pure powdered chilis, or it may have other additives, especially cumin, oregano, garlic powder, and salt. 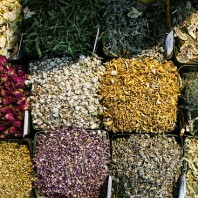 Some mixes may even include black pepper, cinnamon, cloves, coriander, mace, nutmeg, or turmeric. As a result of the various different potential additives, the spiciness of any given chili powder is incredibly variable. As a rule, the purer the chili powder is, the spicier it is.Chili powder has been important ingredient of traditional Indian cuisine.Today they are especially popular in American cuisine, where they are the primary flavor ingredient in chili con carne. The first commercial blends of chili powder in the U.S. were created in the 1890s by D.C. Pendery and William Gebhardt for precisely this dish. My brother Walt made his own chili powder from hot peppers he grew in his back yard. That powder was the hottest thing I’ve ever put in my mouth, bar none. Find a chili powder that you are happen with and can use with confidence. And as always read the ingredients and watch for too many additives, like MSG, Aluminum, etc. Dry mustard (referred to as ground mustard in many recipes) is made from mustard seeds that have been finely ground. When a recipe calls for prepared mustard, use yellow or brown mustard commonly served as a condiment. Dry mustard is a great additive for making a rub for meats or poultry. You can buy brown or yellow mustard seeds and grind your own when you need it. Paprika is a spice made from the grinding of dried sweet red or green bell peppers (Capsicum annuum). In many European countries, the word paprika also refers to bell peppers themselves. The seasoning is used in many cuisines to add color and flavor to dishes. Paprika is great for adding color to a dish. It isn’t hot at it can be a little sweet. I got a pound of smoked paprika from The San Francisco Herb Company http://www.sfherb.com/ and I use it in all of my meat rubs and any dish that can use a smoky flavor. Dry products don’t dilute the dish and add strong flavor. Thyme is one of the best known and most widely-used culinary herbs. It is quite easy to grow and is commonly found as a decorative as well as a functional plant in many home gardens. You will find thyme a welcome flavor in salads, soups, chowders, sauces, breads, vegetable and meat dishes, and even jellies and desserts. Thyme is an essential ingredient in bouquet garni, as well as a prime ingredient in the expensive Benedictine liqueur. When cooking with thyme, be aware that one fresh sprig equals the flavoring power of one-half teaspoon of dried thyme. Tarragon is one of the four fines herbes of French cooking, and particularly suitable for chicken, fish and egg dishes. Tarragon is one of the main components of Béarnaise sauce. Fresh, lightly bruised sprigs of tarragon may be steeped in vinegar to impart their flavor.Tarragon is used to flavor a popular carbonated soft drink in the countries of Armenia, Georgia and, by extension, Russia. Lemon pepper is a spice which is made by mixing lemon zest with pepper. There are a wide range of uses for lemon pepper, from a spice rub for grilled meats to a zesty topping for pasta. Many markets carry packaged lemon pepper in their spice sections, and it is also relatively easy to make lemon pepper at home. By making this spice at home, cooks can control the ingredient proportions and play around with variations which might include ingredients like white or red pepper. I use lemon pepper on every piece of meat or chicken I cook. I always have at least 2 large containers of McCormick’s lemon pepper in the house at all times.When I make my pork tenderloins I rub the outside with lemon pepper before I brown the meat. The same with rotisserie chicken. 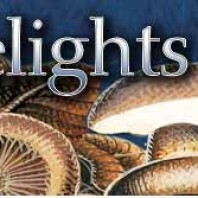 Earthy Delights is America’s premier supplier of specialty foods to quality conscious American Chefs. We pioneered the use of overnight delivery to get fresh produce from the farm to the kitchen in the shortest time possible. We are leaders in offering wild-harvested and hand-crafted foods from small harvesters and growers to a larger audience. Now we are bringing this same selection of fine products to the adventurous home chef, using the power of the internet.We offer wild mushrooms and other seasonal wild-harvested items, fresh specialty produce, fine hand-crafted cheese, aged balsamic vinegar, exotic spices and hard-to find ingredients to the professional chef and the at-home culinary artist. As the palate of the American public becomes more sophisticated, our catalog of fine foods is constantly expanding to meet and anticipate the needs of the adventurous professional and at-home chef. Just as Earthy Delights used the emerging technologies of fax machines and overnight delivery to create a new business paradigm in the 1990’s, we are using the breakthroughs in information technology to create a new business model for the 21st century. We are becoming a valuable resource for a wide range of information on gourmet ingredients and their use. Just as important, we will use these exciting technologies to transform our workplace into an efficiently run, yet humane and nurturing place. We cannot live without food – why not eat well? We will find foods that are made with integrity, that make eating a pleasure, and that are healthful. We pledge to treat our suppliers, our products, our customers, and one another with caring and with respect. Salt Traders began with a fascination for specialty salts. Founders Rob Seideman and Kelly Hall owned the Cooking School of Aspen, which they opened in 1998. Their interest and education in the subject of specialty salts grew and they began offering a variety of salts and peppercorns at their school. Eventually, they focused all their energy on Salt Traders, educating chefs and the public on the benefits and vast array of sea salts available around the world. Rob and Kelly were central to the emergence of sea salt as a popular condiment and introduced it to home and restaurant kitchens across the country. Didi Davis is a chef, food writer, teacher, and editor. She began her training in 1972 with world-renowned chef, cooking teacher, and food writer Madeleine Kamman. Didi worked for Ms. Kamman for ten years teaching in her non-professional and professional cooking school, working at and managing her restaurant Chez La Mere Madeleine in Newton Centre, Massachusetts, and later, working at her cooking school in Annecy, France. In 1982 Didi and her business partner Linda Marino opened their own cooking school, Cooking at The French Library, in Boston, Massachusetts. Their school was given a Best of Boston award by Boston Magazine, 1982, and featured in Bon Appetit magazine. While operating the school, Didi’s desire to write unfolded and she began writing for several food magazines and newspapers. The school was eventually closed so Linda could pursue catering and Didi could expand her writing. Didi’s food writing evolved into writing cookbooks. She authored A Fresh Look at Saucing Foods, which was nominated for an International Association of Culinary Professionals (IACP) Award, and Side Dishes Creative and Simple. In addition to her own books, Didi became known as a chef with the knowledge and expertise to refine and create recipes. She began a side business of recipe development, testing, and editing for several important cookbooks. Among them are the 1997 revision of Joy of Cooking and the award-winning Zuni Cafe Cookbook, authored by Judy Rogers. Most recently, Didi worked on Molly Stevens’ All About Braising which won the IACP and the James Beard Foundation awards for best Single Subject cookbook published in 2004. After several years of freelance work and raising her son, Didi found that she missed teaching. She opened The Payne Street Cooking School in Ipswich, Massachusetts in 2003. This led her to search for fine, artisanal ingredients for her students to use. On a 2004 trip to Paris, she discovered flavored salt and began creating her own for use in her cooking classes. She then started didi davis food, llc, to offer her proprietary salt blends, sugar blends, and speciatly food products for sale. In 2008, Didi acquired Salt Traders to expand her collection of artisanal and specialty food products.